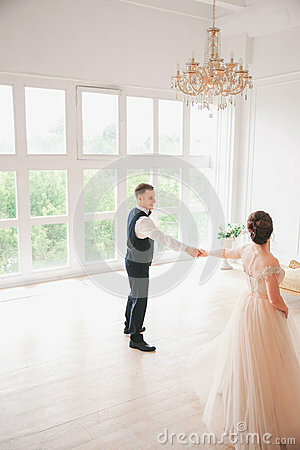 First wedding danc.wedding couple dances on the studio. Wedding day. Happy young bride and groom on their wedding day. First wedding danc.wedding couple dances on the studio. Wedding day. Happy young bride and groom on their wedding day. Wedding couple - new family. Wedding dress.